The chronic fatigue syndrome is a disease that affects approximately 0.3% -0.5% of the Spanish population (about 120,000 to 200,000 people) and currently has no cure: only you can work to mitigate the symptoms They present in the individual. It usually affects adults between 30 and 50 years, but mostly occurs in women. It is a complex disease characterized by an overwhelming fatigue that the patient may not recover in spite of resting in bed, which would be necessary in a healthy person, and that is accompanied by a multitude of symptoms. Today we dig a little deeper in this disease, to raise awareness of their existence. The chronic fatigue syndrome, as we said, is a disease that occurs in a small part of the population (diagnosed, of course) and is the sudden onset of extreme fatigue that is very difficult to recover , despite rest in bed. Chronic fatigue syndrome are linked many symptoms of various kinds that can affect the daily lives of people who suffer: from headache and slight fever to anxiety, sleep disorders , depression, loss of memory and concentration, joint pain (without swelling), tender lymph nodes (located in the neck or armpits) or irritable bowel syndrome. Why chronic fatigue syndrome occurs? At present the specific causes of this disease are not known , although it may be linked to Epstein Barr virus, the human herpes type 6 (HHV-6) or inflammation of the nervous system virus. Other causes may be associated with age (is more prevalent in adults), genetic causes or environmental factors. There are no specific tests to detect chronic fatigue syndrome, although there are some that can help such as MRI of the brain or red blood cell count. Nor is it easy todiagnose disease, since fatigue is a symptom associated with many other diseases that must be ruled out first. Generally, if we notice extreme fatigue that we can not recover and that persists for more than six months, if it took more than 24 in recover after sporting activity or if we observe at least four of the symptoms described above , should go to our doctor for their opinion and testing as required. 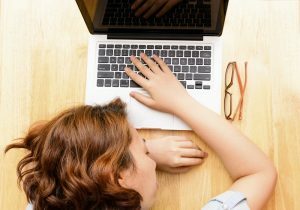 What is the treatment of chronic fatigue syndrome? There is currently no actual treatment that can end the disease, so that health efforts are aimed at mitigating the symptoms that accompany this disease , thus improving the quality of life of patients. The disease is tackled from multidisciplinary treatment in which brings together cognitive-behavioral therapy, healthy diet, exercise and medication gradually if there is pain, anxiety (anxiety) or depression (antidepressants). Patients are also encouraged to try to lead an active social life that do not isolate the environment, as well as learning different relaxation techniques and stress reduction. Previous post: Food scares: When should we care? Next post: How should a vegetarian diet to lose weight?